by Major William T. James Jr. This study investigates what effect the evolution of urban combat from World War II to the present has had on current urban combat doctrine. Urban combat operations have played a pivotal role in the conflicts of the twentieth century, and will continue to be a crucial part of future U.S. power projection operations. It is imperative that lessons learned from previous urban combat operations be studied for applicability to current urban combat doctrine. 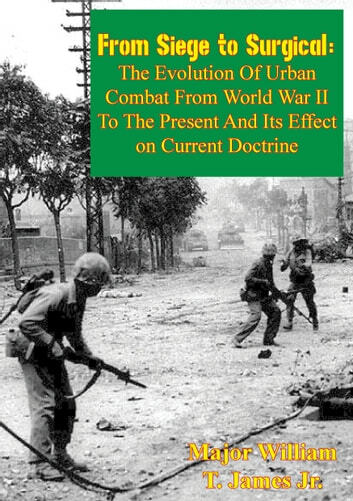 The study analyzes the urban battles of Aachen, Manila, Seoul, Hue, JUST CAUSE, and Mogadishu to identify salient lessons for conducting successful offensive urban combat operations; then reviews current U.S. Army urban combat doctrine. The study then evaluates current doctrine using identified salient lessons to determine their effect. The study finds that the primary impacts of previous urban combat operations on current doctrine are that doctrine now embraces the idea of varied conditions for urban combat and validates the concept of fighting as a combined arms team in a built-up area. The study further finds that FM 90-10, Military Operations on Urban Terrain is obsolete, and that key procurement decisions have left U.S. forces without critical weapons that have proven decisive in urban combat.